Protect your investment! Increases consoles air intake. 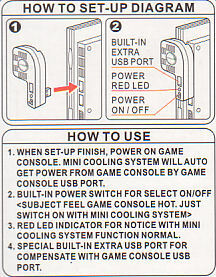 Easy Installation: Adhesive back along the back of this fan will secure the unit to the PS2 console tightly. No tools necessary! No external power necessary - powers directly from PS2 console! This product was added to our catalog on Thursday 25 September, 2008.